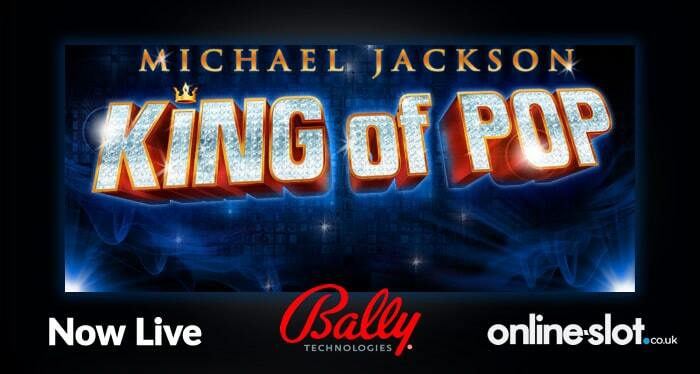 Bally Technologies has today launched the Michael Jackson King of Pop slot – read about this popular land based game that is finally available to play online. Michael Jackson King of Pop has been available to play in land based casinos for years – it’s now available online. Powered by Bally, the 5 reel, 25 payline offering can be played from just 40p per spin on all devices. If you like his music, you are in for a treat as Beat It, Bad, Billie Jean, Dirty Diana and Smooth Criminal play as you spin the reels. Symbols on the reels include the infamous glove, his sunglasses, hat, and shoes. Look out for the Michael Jackson jackpot symbol which will give you 2,500 times your line stake if you find on a payline. In terms of bonus features though, there are plenty. Look out for Moonwalk Wilds in the base game as up to 5 can appear randomly – if they contribute to a winning combination, they will double your wins. There’s also a Stacked Wilds feature triggered in the base game where 2 reels can become fully wild. The main attraction is the Wheel Bonus feature where you spin the wheel to reveal cash prizes, cash prizes and more spins of the wheel, and access to 2 free spins features. The Beat It Free Games feature gives you 10 free spins with sticky wilds on 4 of the 5 reels. The Smooth Criminal Free Games feature gives you 5 free spins but you get up to 2 wild reels on each free spin. With iconic songs, clips from his music videos and rewarding bonus features, what more could you want? For full details and to play for free first, check out the Michael Jackson King of Pop slot review. I recommend you play Michael Jackson King of Pop at Mr Green Casino who have a superb offer to win tickets to Michael Jackson’s ONE in Las Vegas. The show has an electrifying fusion of acrobatics, dance and showmanship which is choreographed by the world famous Cirque du Soleil. Mr Green Casino is home to slots from Bally, WMS Gaming, Barcrest, Net Entertainment, IGT, Play ‘N Go, NextGen Gaming -the list goes on! Online-Slot.co.uk readers are welcomed with an exclusive 20 no deposit free spins on NetEnt’s Jimi Hendrix. There’s also a 100% match bonus up to £100 plus 100 Marvellous Mr Green free spins once you deposit.